This is a 1 liter bottle of transmission fluid for your B7-A4 2.0T with front wheel drive and the Continuously Variable Transmission (CVT). This fluid is made by Febi-Bilstein, one of the world's leading suppliers of replacement parts for Audis. 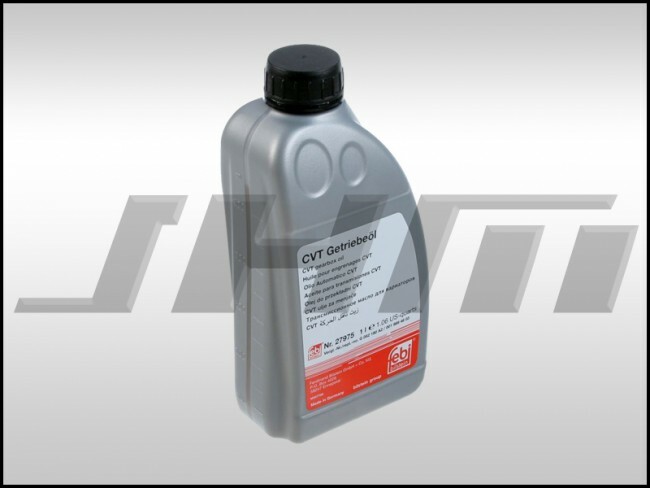 This is a high-performance automatic transmission fluid (ATF) made specifically for CVTs driven by belts. It has excellent wear protection (especially in the difficult conditions of a CVT), optimum low-temperature properties, low friction losses, and optimum behavior over the entire life of the fluid. This fluid meets the VW LT 521 80 specification from Audi-VW for use in its CVT vehicles. The CVT in the FWD B7-A4 2.0T takes 7.7L of fluid. So if you're filling up a drained transmission, you should order 8 bottles. If you're looking to flush out your transmission, you should buy about 11 total.